BPI Real Thrills! Free Meals @ Jolibee!!! Now, expect more thrills as you experience more freedom! Pay for your bills conveniently through any of BPI's 24/7 Banking Channels: Express Online, Express Phone and Express Mobile and be free from the hassle of traveling and going to a payment center, or the inconvenience of falling in line or rushing just to beat closing time. And because BPI 24/7 Banking gives you the "freedom from" then you have the "freedom to". Be free to spend time for yourself, and to be with your loved ones, or to do what you really want to do. Plus, get the thrill of receiving freebies at your favorite stores! Because for every bills payment transaction you make, you rack up on credits, which you can exchange for choice items at our Real Thrills partner merchant- Jollibee. All you need to do is register once, and all your qualified bills payment transactions during the promo period automatically earn you credits. Redeeming is also hassle-free! Simply choose the item that you want to redeem; you get a text message, which serves as your mobile coupon. Present this at any of the participating partner merchant stores and you get your reward. Never before has paying bills become so thrilling! Pay your bills through BPI Express Online, Express Phone, or Express Mobile, and get free Jollibee treats! Simply present the mobile coupon/s* that will be sent to your cell phone and your ATM Card at any Jollibee outlet! Go to BPI Mag Online for more details! Buy one take one at Topshop, Topman, and Dorothy Perkins from January 29 to 31!!!! Last week of Sale! FURTHER REDUCTION starts TODAY. Less 25% items NOW 50% off! This is your last chance ladies! Visit Unarosa at Shangrila Plaza Mall, SM Megamall, The Block SM North Edsa, Shoppesville Greenhills, SM Fairview and Marquee Pampanga. Visit www.una-rosa.com or their facebook account for more information! Cebu Pacific Go Lite Fare!!!! North Luzon and select Visayas destinations are on sale for as low P699! For more information, visit www.shopwise.com.ph now!!! Get a 50% discount on Neutrogena® Wave’s Deep Clean Foaming Pad Refill! Healthway’s Power of 5 promo! Basic 5 Annual Physical Exam (APE) package for only Php 500! Start the year with a clean slate. Purge yourself from all that unwanted fat and cholesterol after the grueling round of parties and bumper feasts from last Christmas. Promo runs from January 15 to February 28, 2010. Availment period is from January 15, 2009 to May 15, 2010. Visit http://www.healthway.com.ph/ for more information! info and photo courtesy of http://www.healthway.com.ph/. The White Hat 2010 Valentines Day Promo! First one hundred (100) couples who present completed TWH VALENTINE'S DAY couple stamp cards at any participating TWH outlets will get two (2) movie tickets to the special screening of VALENTINE'S DAY on Feb. 13, 2010, 7.30 pm at Shangri-La Cineplex Cinema 1. Tickets can be claimed up to Feb. 13 or until supplies last. Stamps on the loyalty card will not be honored for the couples card promo. For those who complete the ten (10) stamps but who have missed the ticket allocation, they can exchange their cards for two (2) REGULR HATS with ONE TOPPING each as their prize. Offer good until Feb. 28, 2010 only. Twenty (20) tickets will be alloted per store. Redemption of tickets is on a first come, first served basis. No reservation of tickets allowed. Promo runs from January 15, to February 28, 2010. Visit http://www.thewhitehat.com.ph/valentines-day-movie-mechanics/ for more information! Sunday lunch buffet at Café Juanita for only P485! From 11:30 a.m. to 2:30 p.m. on Sundays, enjoy a spread of Café Juanita’s well-loved dishes along with other Filipino “lutong bahay” favorites. The Sunday brunch is available only at the Pasig branch: 27 United Street corner West Capitol Drive, Barrio Kapitolyo, Pasig City. Call 632-0357 for reservations. Order-all-you-can weekend at Chef Laudico Bistro Filipino for P788! Chef Laudico Bistro Filipino is at G/F Net 2 Building, 3rd Avenue, Fort Bonifacio Global City, Taguig City. Tel. Nos. 856-0541, 856-9634 and 856-0541. For more information, contact Melynn at +63.2.844.5187 / +63.917.823.6690 / or email at inavtravel (at) yahoo (dot) com. Visit http://blog.inavtravel.com/2009/12/11/astorias-hotel-2010-promo-package/ for more information. Rush to the nearest branch and enjoy new marked down items! Sale runs until stocks last. 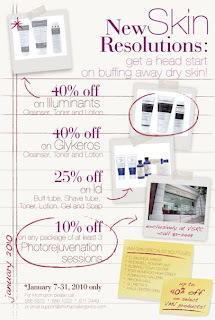 Start 2010's retail therapy now! Spotlight Bazaar @ The Rockwell Tent 2/6/2010 & 2/7/2010! Thank you www.shopcrazy.com.ph for the info. To celebrate the arrival of our second B777 aircraft during the Valentine season we are pleased to introduce our triple seven promo Valentine Special. You may also call PAL Reservations at (02) 855-8888, Cebu: (032) 340-0191; Davao (082) 222-0366 or purchase tickets at PAL Ticket Offices or your travel agent. Note: Senior Citizen discounts are not available through our online booking facility. Only purchases made at the Philippine-based ticket offices may avail of the discount. Visit http://www.philippineairlines.com/special_offers/valentine_promo_domestic/valentine.jsp for more information. Manila Hotel's "All you can eat lunch and dinner feasts"
Manila Hotel's new Chinese restaurant, Mabuhay Palace, was launched December last year with a tempting "All you can eat lunch and dinner feasts" promo. The good news is that the extraordinary gastronomic blend of dishes may still be enjoyed by food afficionados until February 16. This is one rare opportunity for guests to experience such delectable culinary offer, especially from a five-star restaurant that has already earned fairly good reviews in so little time. Philippine Tatler, for example, has recognized Mabuhay Palace as one of the country’s best restaurants for 2009. So what are you waiting for? 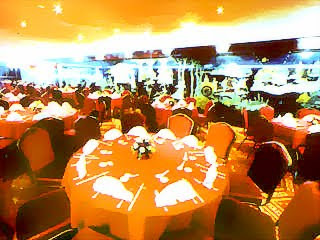 Visit the country's prestigious hotel and have an authentic Chinese feast to your heart's desire! For more information and reservations, please call (632) 527-0011 local 7. Sun Cellular Easy Postpaid Plan!!! Hassle Free Activation! Looking for an instant Postpaid Line? Sun brings you the Sun Easy Postpaid Starter Plan! Sun now offers you an easy way to get a postpaid line that does not require you to submit documents such as proof of billing or proof of income. Get a Sun Easy Postpaid plan today and start enjoying 24/7 Call & Text Unlimited*** plus 250 free texts to other networks****. * Cash-out will vary depending on the phone model. ** Given for twelve (12) months. Rebate amount depends on the phone option. *** Local Sun-to-Sun calls and texts only. **** FREE SMS for Regular Plans only. Visit the nearest Sun Cellular Center now or go to http://www.suncellular.com.ph/ to know more! Grab a P999 seat for the summer! Jumpstart the summer travel season with P999 ‘Go Lite’ seat sale starting now until January 15, 2010, for travel this February 1 to April 4, 2010. Up for grabs are major local tourist destinations such as Boracay (Kalibo), Puerto Princesa, Busuanga, Naga, Legazpi, San Jose (Mindoro), Tagbilaran (Bohol), Cebu, Laoag (Ilocos Norte), Siargao, Cagayan de Oro and Davao. A total of 32 domestic destinations to choose from and accessible through hubs across the country: Manila, Cebu, Clark and Davao. Try our Inter-island routes, a smash hit for those going home or opting to take weekend vacations with friends. These routes include Davao-Iloilo, Davao-Cagayan de Oro, Cebu-Dumaguete, Cebu-Ozamiz and Clark-Cebu. Log on to www.cebupacificair.com and plan your summer travels as early as now! GOOD NEWS! Passengers without credit cards can book online and pay through CEB partner banks (Bancnet, Megalink, Metrobank, Banco de Oro and Robinsons Savings Bank). Photo courtesy of Cebu Pacific. Gelatone's New Treat for the New Year! Located at the 2nd floor of GB3, Gelatone! opens 2010 with an EAT ALL YOU CAN PROMO that will surely make you crazy over gelato. Visit Click The City for more info! Globe Tattoo's Free Saosin Concert Ticket!!! Globe is giving out free Saosin Concert Ticket!!! This promo is open to everyone. All you have to do is either buy a Globe Tattoo stick worth P895.00 or get P900.00 worth of prepaid load at the Globe Business Center, Glorietta 3, Ayala Center and you will get one (1) free ticket! The promo period is from January 12 to January 22, 2010! We’ve got a limited number of tickets, so rush on down to Glorietta 3 and get the goods! Visit http://tattoo.globe.com.ph/gblog/2010/01/globe-tattoo-presents-saosin-live-in-manila/ for more information. Godiva Quezon Avenue Mesofusion Introductory Promo! For more inquiries, contact Godiva Quezon Avenue at 382-2222, 926-2828 or 0922-8081210. Or visit them at the 2nd Floor, Crispina Building along Quezon Avenue corner Examiner Street, Quezon City (across Sykes building). Godiva Quezon Avenue New Year, New You Promo! Cebu Pacific Offers Clark – Cebu and vice versa for as low as Php 101! Clark Seat Sale starts NOW! Fly from Clark to domestic or international destinations at a price you can’t refuse. Fly Clark – Cebu and vice versa for as low as Php 101! fly from Clark to Hong Kong, Macau, Singapore or Bangkok for as low as Php 1099! Hurry, this sale ends on jan 13, 2010! Travel is valid from Feb 1 – Apr 30, 2010. Just in time for Valentine’s and the start of the Summer break. Passengers can call CEB reservations hotlines (02)7020-888 or (032) 230-8888, check www.cebupacificair.com or visit nearest travel agents. Those without credit cards can still book online and pay via CEB partner banks (Bancnet, Megalink, Metrobank, Robinsons Savings Bank and Banco de Oro). SuperSale Bazaar @ the Rockwell Tent 1/16 & 1/17, 2010! Visit www.stylebible.ph for more information! Handyman New Year Clerance Sale from 1/1/2010 to 1/31/2010! Get up to 70% off on selected items and organize your home!!! Visit http://www.handyman.com.ph for more information! ATC's End of Season Sale 1/2/2010 to 1/17/2010!!! Rush to Alabang Now!!!! 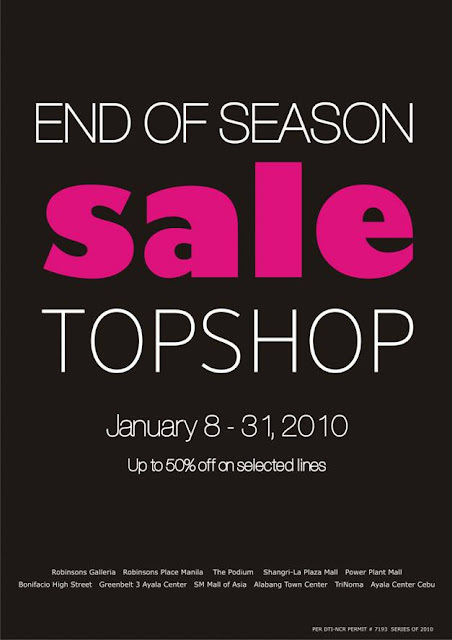 Alabang Town Center is having their End-Of-Season Sale from 1/2/2010 to 1/17/2010!!! Get up to 40% discount @ Marks & Spencer! From January 3, 2010 to January 31, 2010, Marks & Spencer is offering up to 40% discount as part of their End of Season Sale!!! Go the nearest Marks & Spencer shop now!!! Robinson's Department Store Clearance Sale! 1/1/2010 to 1/31/2010! Take part in the ultimate shopping extravaganza as we give you the hottest items and the biggest discounts in Robinsons Department Store’s Clearance Sale. Clear the racks and enjoy your favorite items up to 70% off! There’s just a lot to love at Robinsons Department Store! Visit Robinson's Department official site for more details! Up to 80% discount in Ayala Malls! 1/2/2010 to 1/17/2010! 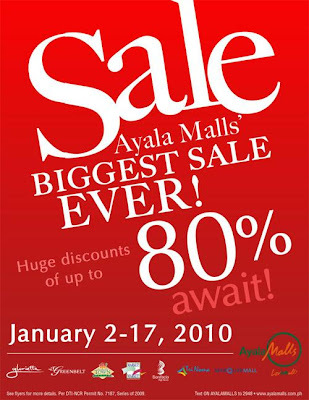 Enjoy up to 80% discount across Ayala Malls from January 2 to 17, 2010!!! Topshop End of Season Sale 1/8/2010 to 1/31/2010! It's end of season sale for Topshop! Get up to 50% discount on selected lines!!!! Feel free to share your top buys for our blog readers reference!!! Folded&Hung Monstrous Sale 1/8/2010 to 2/14/2010! Cebu Pacific Offers 50%-off System-Wide Seat Sale in all destinations! Start the year with a bang! Our 50%-off System-wide Seat Sale starts NOW! Avail of a 50% discount on all domestic and international destinations. The seat sale period starts from January 6-8, 2010, for travel this February 1-April 30, 2010. As for its other hubs, CEB has direct flights from Cebu to 20 domestic and 4 international destinations (Singapore, Hong Kong, Pusan and Incheon), and from Davao to Manila, Cebu, Iloilo, Zamboanga and Cagayan de Oro. It also flies from Clark to Cebu, Hong Kong, Singapore, Macau and Bangkok. VMV Philipines Exclusive Sale until 1/31/2010!